Calista Leah Liew: Who needs such a big one??? Now, I know you must be wondering about what I'm referring to. Well, it's this! Dont look too bad to you? What about now? I mean, I know I have a small head and all, but honestly, this is a bit over the top dont you think? "For a heavy flow" it says.. How heavy??? 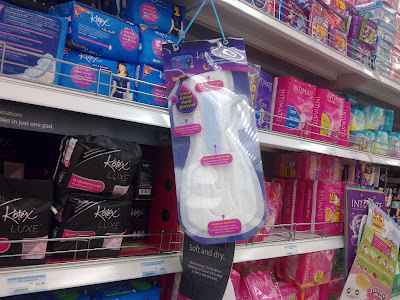 Are you telling me before the invention of this massive thing women who have a heavy flow had to be in diapers?? I think the problem here is not how big the pad is, but the education on how to use one properly! Hahaha.. I know right?!?! Lolsifying.. Hahahaha..
That's for overnight? zomg it's huge! That is basically a diaper..
after giving birth bah this mungkin... huhuhu. Well, I'm not a gal so I dunno much about that stuff. But I surely know that no one needs to use that big LOL.